My name is Samantha and for my daughter’s second birthday she very badly wanted a “princess ballerina” birthday cake. For anyone who has met Reilly, this is no surprise She is not only a girly girl in every sense, but a very particular one at that! So now to go about this…. 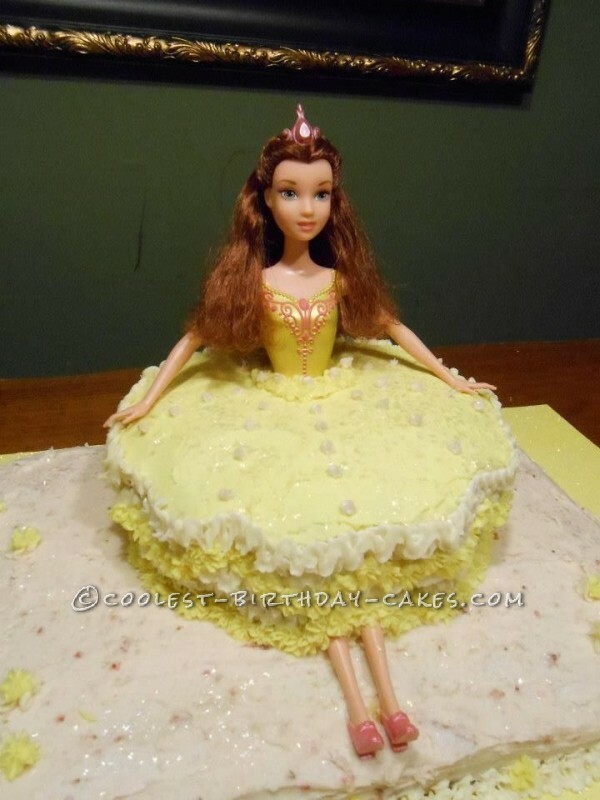 First I googled every combination of ‘ballerina’ and ‘princess’ cake I could and bookmarked all my favorites. 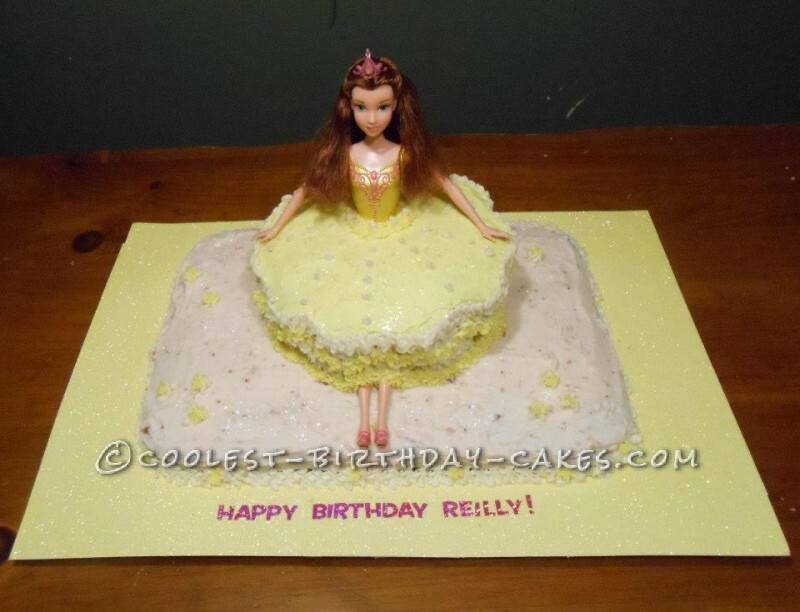 Then I decided to go a more old fashioned route and make a doll cake similar to those that were so popular in the 60’s (according to my grandmother anyway!). On a trip to Walmart I smuggled a Belle barbie doll into the cart without Reilly noticing. Even going so far as to write a note to the cashier to hide that doll. He was great – he triple bagged it. 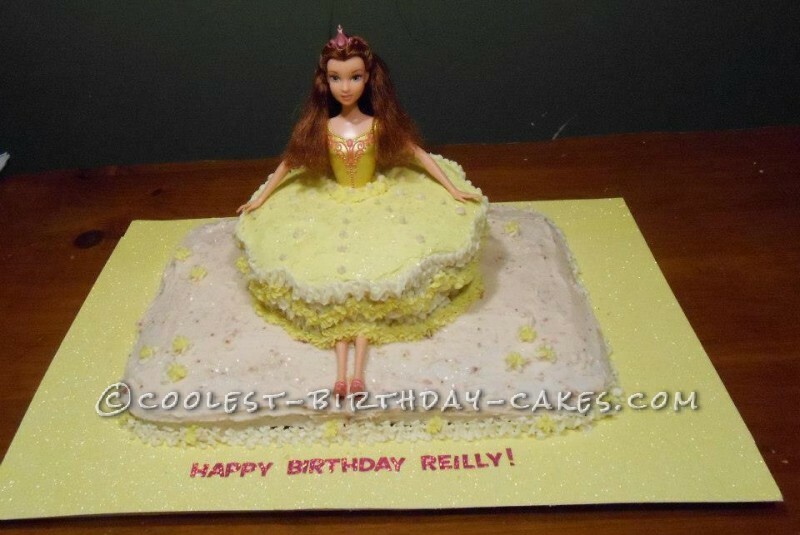 The night before Reilly’s party I baked 1 organic chocolate sheet cake and 2 round yellow organic cakes. Once they cooled I iced the sheet cake with strawberry frosting. First I made a simple butter cream and then pureed some strawberries, boiled them down and added them to the butter cream. It tastes fantastic and “dyes” the frosting pink. Next I placed the round cakes on top. Then the really hard part – I shoved the doll through the top while angling her in such a way her feet would pop out the bottom. It wasn’t easy! Then I made yellow dye by adding a slight amount of turmeric to the plain butter cream. I also left out some plain. Then I iced the whole dress trying to make ruffles the best I could. After I was done I used some cake sparkles that were essentially just sugar. The cake was done! The next day my daughter (and son) were so excited to see it! It tasted fantastic and everyone had a great time! What size were the round cakes? Would a 9inch pan be too big for her skirt?